One from the golden age of horror... This film (more widely known as the namesake inspiration behind Rob Zombie's band, White Zombie) holds up remarkably well even now, an immensely watchable film that has earned its place in cult movie history. 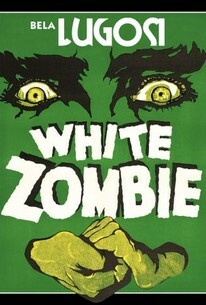 Shot in black and white and dating back to the 1930's this is probably the earliest of the zombie flicks I have seen. No gore or special effects to speak of in this film, it has to rely on plot, dramatisation, musical score and acting and it comes across as a very solid film even from the point of view of a modern (well 80's horror fan) movie fan. The plot follows a young man Neil who is moving up in the world and his soon to be wife Madeline on the island of Haiti, where upon arrival they are greeted by stories and a close encounter of the undead roaming the island at night and working in the sugar mills (Good to see someone smart enough to put those zombies to work... think of all that free labour going to waste in modern zombie films) ... What I like about the story line in this film is that it sits closer to the historical origin of zombies than the "Night of the living dead" style zombies which is a pleasant change. Madeline has also unfortunately attracted the attention of Charles a wealthy businessman from the island who decides that since he can't have her he will turn her into a zombie. Some kind soul has been kind enough to upload a remastered version of this classic! check it out below! Be sure to check out http://www.gorenography.com on a regular basis! 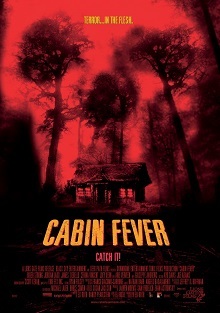 After the mind numbing stupidity that was "Children of the Living Dead" (See last review) I couldn't leave my weekend of horror limited to just that that so I threw on "Cabin Fever" to try and redeem proceedings. I don't rate this as Roth's best work as director but I have to say its quite enjoyable, and keeps you interested enough whilst still being simple enough you can watch it while your having a chat with friends or whatever. The plot revolves around the age old cliché of the group of teenagers going out into the woods to party, they rent a cabin and the usual assortment of teenage hijinx ensures. whilst partying and the usual stuff one of the teens accidently shoots a local who is infected with a strange disease that is rotting his flesh away. The infected local tries to get help from the teenagers but understandably they don't want anything to do with him. Like any good disease it is highly contagious, and the carrier is highly persistent in his endeavors to get back at the teenagers. The teenagers have to stick together and find a way out of the forest without falling prey to the deadly disease which starts to spread. As you can imagine this paves the way for some very decent levels of gore, which I have to say was rather well done, especially considering Mr. Roth shot this film as an independent and it was his first feature length film. Over all this is a pretty cool film, the acting (from the unkown cast) was as good as it needed to be for this kind of film and the gore effects were meaty and convincing enough to keep most gore hounds happy. and paved the way for Eli Roth to become a household name not only in gore films but mainstream cinema as well after this independently produced film was piced up by NewLine and took in box office takings of around $35 million worldwide (from a $3.5m budget). While this is no classic in my opinion its definitely a pretty solid and enjoyable flick! For more great horror movie news and reviews be sure to check out http://www.gorenography.com on a regular basis! Another attempt to cash in on the monumental legacy of "Night of the Living Dead". This is what I would call "D Grade" horror, it could have easily made it into the realms of "B Grade" horror if the people involved had put a bit more work/time into it, especially with special effects maestro Tom Savini as part of the crew. The acting is a bit hammy (...well not just a bit...) most of the way through the film, but the zombies are quite reasonable and look fairly convincing. Tom Savini takes an early role in the film and also looks pretty convincing. I'm going to be honest and say I'm not entirely sure what the movie is about, basically there's zombies and stuff, but I got distracted by some off color production work, very unprofessional... the movie seemed in focus for a bit and then went an off color yellow … then back in and this, where I started to focus on finding fault with the movie rather than focusing in on what was going on. As you could imagine .. 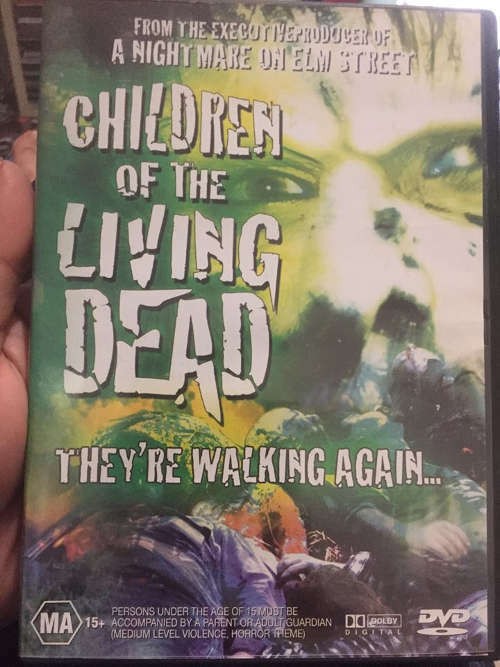 I couldn't make it through to the end so whatever... glad I didn't pay much for this one (again it was a flea market punt) but it is a shame to see the "...Living Dead" name dragged through the mud and its also a shame to see Tom Savini wasting his time on such crap. I can't honeslty give this one any kind of recommendation unless your some sort of "Living Dead" completist or you compulsively collect horror down to this level. Best avoid. For more great horror movie reviews and other things be sure to check out http://www.gorenography.com on a regular basis! The original "Omen" film is one of my all time favourate films. I'd seen this version when it came out at the cinemas (we don't get a lot of horror flicks make to the big screen here in Australia, and even when they do they're only on for a couple of days so If you can't make it you miss out) and I have to say I really enjoyed it. Now a little over 10 years later I thought I'd give it re-watch and see how it goes. This version (Also called "The Omen 666" … presumably because it was released into cinemas on the 6.6.06) seems to follow the first version of the film fairly closely, there's subtle differences, enough to keep it interesting but essentially its a pretty close re-telling of the original. Some would argue that the original was a masterpiece (and I'd agree with that) but this is pretty damn good too and would serve to introduce younger horror fans to a classic storyline. Basically the plot revolves around young couple Robert and Katherine who are expecting their first baby which unfortunately dies in the childbirth process... one of the priests at the hospital they had their child at suggests to Robert that he take an unclaimed baby as their own without the mother knowing her own child had died. Only problem is the child turns out to be the son of Satan … and of course a series of mysterious events and deaths follow in the child's wake. People start to notice there is something "up" with Damien including a photographer, Damien's mother and of course the priest that suggested the swap in the first place. Can they stop young Damien from becoming the living embodiment of Satan on Earth? Well that's up to you to watch the movie and find out! Overall I was really happy with this while there's no major reason to watch this one as opposed to the original (they are pretty similar) this is well done and in my opinion doesn't damage the quite formidable legacy of the original film. Younger audiences may find this one easier to watch than the original as it basially moves with the time and has a more modern sense about it. Fans of the old film will still like this as it has that old biblical feel about it (the original film was heavily referenced to the book of revelations in the Holy Bible) which gives it that arcane / well researched feel, which does add an air of creepiness to proceedings. 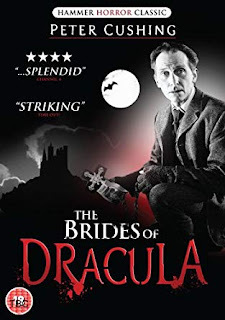 Well.. time to explore the semi distant dark past of the horror industry with some "Hammer Horror" flicks .. for this time round I chose "Brides of Dracula". This is set after Dracula's death and revolves around the Baroness and young Marianne who is on her way to take up a job in Transylvania. of course the local coach driver who is still wary of the myths of Dracula that surround the region won't proceed to Transylvania and drops her off at the local tavern. Marianne can't find a room to stay so she takes refuge with a wealthy countess for the night. The countess keeps her son in chains within the house, she claims he is mentally unwell, but Marianne's curiosity gets the better of her and she meets him and finds him rather personable. It would appear the son is the heir apparent to the property and the countess is trying to keep him from claiming it. Marianne takes it upon herself to free the Countess' Son … without realizing he's a vampire. Once loose the vampire is free to prey on the town folks and it up to the Dr. Van Helsing (the vampire hunter of Dracula fame / played by horror icon Peter Cushing) who just happens to be passing through town and Marianne to stop him. Overall, its a well written and shot film, the violence levels are low so you can watching it with your horror loving offspring, tho some more may find the movie a little "campy", its definitely shot in that English drama style with a hint to Shakespeare, but if you can deal with that its a pretty cool movie! For more great horror movie reviews and news be sure to check out http://www.gorenography.com on a regular basis!